Almost one in 10 of the world’s population, 679 million, are children younger than five years old. To thrive and develop, these children and their older siblings need care. Yet in many parts of the world, childcare remains scarce. Globally, just over half of the children under age five benefit from a preschool program. Formal childcare is often outside the reach of lowand middle-income employees. For those who can afford it, available options are often limited and poorly aligned with full-time working hours. Access to care is particularly lacking for children younger than three. For employers, the lack of good quality and affordable childcare for their employees can translate into higher turnover and absenteeism, lower productivity, and difficulty recruiting skilled employees. This is because the unavailability or unaffordability of care affects the choices that parents make regarding the type of work that they do, whether they stay at home, or how they combine work with care. For families, gaps in access to quality care can mean less paid working time and lower household incomes. Because women are more likely than men to bear childcare responsibilities, lack of childcare is a major barrier to women’s full and equal participation in paid work. According to the International Labour Organization, globally, women’s labor force participation rate is just over 49 percent, nearly 27 percentage points lower than the rate for men. A McKinsey Global Institute study estimated that closing gender gaps in economic participation would increase global gross domestic product (GDP) by 26 percent by 2025, adding $12 trillion. Evidence from the Caribbean, Latin America, and Organisation for Economic Co-operation and Development (OECD) countries suggests that access to subsidized childcare can have a significant positive impact on women’s employment rates and the number of hours that women work. Policymakers internationally are recognizing the importance of access to childcare for both economic and gender equality. To date, 192 nations have signed the Global Goals for Sustainable Development, which include the target, “By 2030, ensure that all girls and boys have access to quality early childhood development, care and preprimary education so that they are ready for primary education.” In countries such as Brazil, Chile, Ecuador, India, Japan, Jordan, and Turkey, statutes require employers to provide or support childcare. Even when not driven by regulatory compliance, many employers are providing childcare supports as part of their general compensation strategy to achieve better business outcomes. Yet there is a lot more that can be done through partnerships and collaboration between the public and private sectors and civil society organizations. For the International Finance Corporation (IFC), a member of the World Bank Group and the largest global development institution focused exclusively on the private sector in developing countries, improving access to childcare goes hand in hand with fostering workplace gender diversity and helping parents enter and advance in the workforce while enabling companies to strengthen their bottom line. IFC’s focus on removing barriers, such as lack of childcare, to women’s (and men’s) access to more and better jobs is embedded in the World Bank Group’s Gender Strategy and IFC’s vision focused on creating markets, particularly in fragile, conflict-affected, and low-income countries. 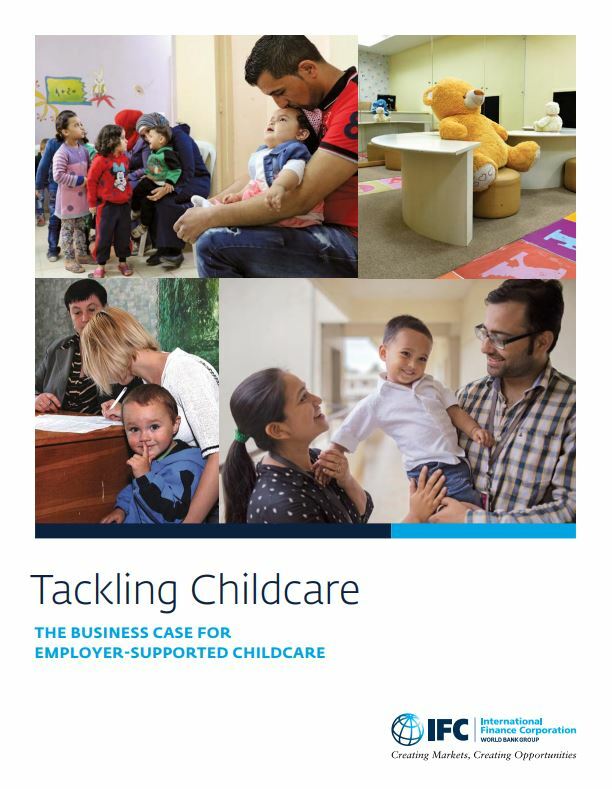 In countries where employer supported childcare is mandatory, IFC is working with its clients to substantiate the business case and to help them go beyond compliance and implement childcare strategies best suited to their business needs, thus resulting in better business results.